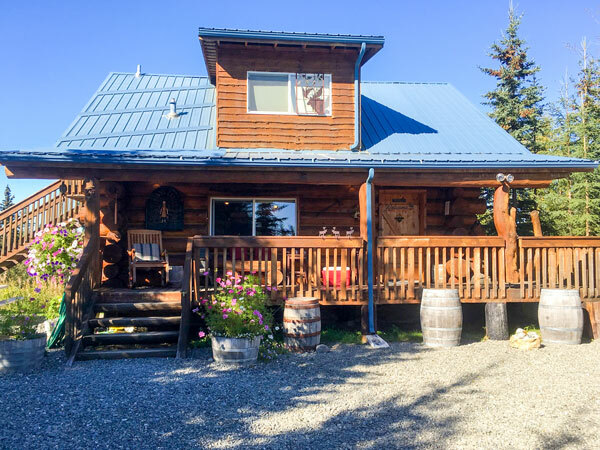 Hand-hewed from local white spruce featuring three fully separate units, each with fully equipped kitchen facilities, private bathroom/showers and private outside entrances. The Grizzly Cabin, featuring a ‘semi-private loft with queen bed. A double and single ‘bunk bed style’ on main floor. Private bathroom/shower and fully equipped kitchen facilities. Each log cabin can accommodate four to six adults. Our cabins offer a quiet and private country setting! Just ‘down the road’ from fish processors and shippers. Usually beginning in late summer and through fall, we are located on a natural route where the local Kenai River Caribou herd passes by our property Moose cows and their calves are an ‘everyday’ sight. Fish cleaning tables for processing you fresh catch! Great memories and plenty of new friends! Our cabins are smoke-free and pets are not allowed. Designated smoking areas are available.